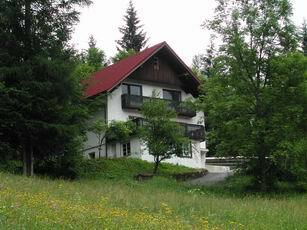 A spacious two bedroom chalet in the mountain village of Planina pod Golico, near Bled. Sleeps four in a double and twin room. The chalet is fully self-contained with equipped kitchen, living room, dining space, large foyer, shower-room and WC. 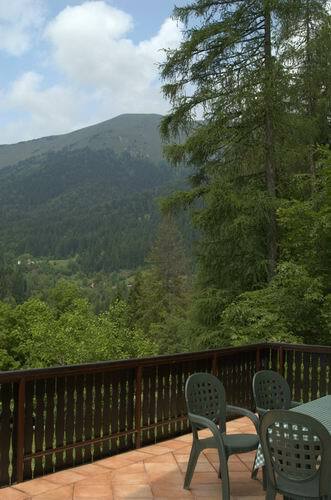 Beautiful mountain views, a garden, and terrace balcony with table and chairs plus BBQ. Your own transport is recommended. The top floor is uninhabited, so you will have the chalet to yourself. Planina pod Golico is about 25 minutes drive from Bled in the Karavanke mountains. From the door, you can hike or cycle through the forests. There is a chair lift in the village which takes you up to a fabulous Alpine view-point and small ski area. The road up the hill and through the village is dead-ended so there's almost no traffic, but the expressway is just 5km away down in the main valley. You'll be ideally placed for all the sightseeing: Bled, Bohinj, Kranjska Gora and the Julian Alps are close by. Ljubljana and Klagenfurt airports are both less than an hour away. The village has a couple of bars and a restaurant. There are supermarkets 10mins down the hill in Jesenice. Other restaurants can be found in and around Jesenice and Bled. Click the tabs on the left for more details, to contact us, or to make a booking. Photos of the interior are on the photos page.